Nothing wastes time and promotes mistakes like poor distribution of important job documents! With TimeDirect, spreadsheets, diagrams, work orders, special instructions, images – just about any file, can be attached to a job by an administrator, and downloaded by the staff. Regular personnel are able to view & download documents for jobs for which they have time and expense entry access. Approvers are able to view & download documents for jobs for which their subordinates have time & expense entry access. 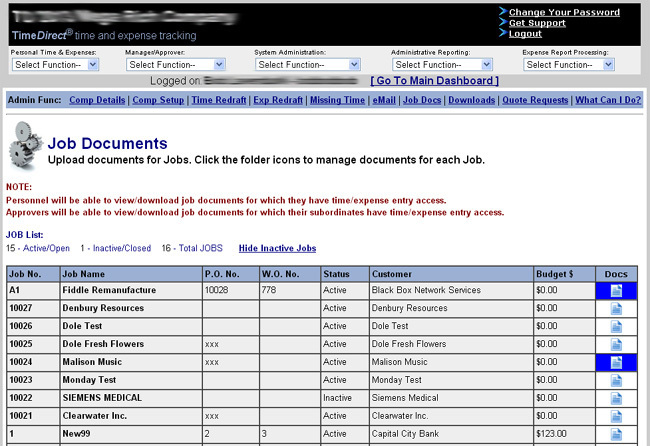 Administrators can view, download, and upload documents for all jobs.